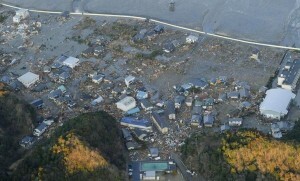 Japan’s most powerful ever earthquake since records began has struck Sendai, which is in the Miyagi region on the north-east coast of Japan triggering a massive tsunami which has unfortunately caused much devastation and death and injuries to many Japanese people in the Miyagi region in Japan. The massive earthquake tremor, measured at 8.9 by the US Geological Survey, hit at 14-46 Japan local time (0546 GMT) at a depth of about 24km. The first waves have rolled thousands of miles to reach Hawaii, but were not expected to cause major damage. The Red Cross in Geneva warned the waves could be higher than some Pacific islands.